Professor Parasuraman is the holder of the James W. McLamore Chair inMarketing and the Vice Dean of faculty in the business school at theUniversity of Miami. His expertise and research is focused on managingservice quality and the role of technology in service. In the early 1980s companies increasingly sought differentiation through customer service. However for the previous three decades, or so, management research and executives had focused on product quality. With growing acceptance that managing services required different approaches and theoretical basis Professor Parasuraman asked a simple question, "What is service quality?" This led to more than two decades of programmatic research. The answer centered on the gap between customer expectations and perceptions of service which was explained through theory and practical measurement tools (including the famous "SERVQUAL" instrument). This body of research has been subject to exhaustive research critque however it has enduring value to executives and researchers. Professor Parasuraman's more recent work on technology on service has already won industry and academic awards continuing his tradition of ground breaking work. In this show we discuss the enduring appeal of Professor Parasurman's work on service quality, views on internationalization of service and a future increasingly focused on technology based services. 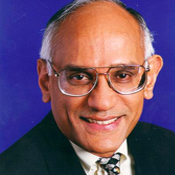 CCC will soon have Professor Parasuraman's lecture online in the Research area. If you are not a member yet, register for free access. Length: 45 minutes. Download MP3 20.67MB (Right click->Save As). In Taipei (from left), James, A. Parasuraman, Clyde and Stephen. iPod Download MP4 175.2MB (Right click->Save As). QuickTime Download MOV 316.75MB (Right click->Save As). Windows Media Download WMV 166.53MB (Right click->Save As). High Quality mp4 H.264(640x480) Download high quality mp4 333.85MB (Right click->Save As). "Really impactive research has to start with what is important to practitioners"
"Your research needs to be programmatic... It de-motivates you because you are doing it piecemeal"
"As an editor I can see that people that have a programmatic stream have an easier time to get their work published"
"I think technology is going to play an increasing role in the delivery of service. What is the optimal mix of high tech versus high touch is going to continue to be an issue from a practical perspective." Practitioner book, "Delivering Service Quality"
Practitioner book, "Techno Ready Marketing"
Vid. 1) The NCCU campus after our interview. (3) Clyde getting animated, while his daughter Anastasia looks on. (3) Clyde getting animated, while his daughter Anastasia looks on. (5) Stephen pointing out his old jogging track up into the hills. (5) Stephen pointing out his old jogging track up into the hills. (6) The camera with its wireless microphones works at an impressive distance. All tagged to make (dis)assembly easy. (6) The camera with its wireless microphones works at an impressive distance. All tagged to make (dis)assembly easy. (7) As we burn up near the air conditioning unit Stephen drives home a key point. (7) As we burn up near the air conditioning unit Stephen drives home a key point. (8) The sight of Taipei 101 was too good to miss; even if it meant standing on a ledge against the outside wall of the building! (8) The sight of Taipei 101 was too good to miss; even if it meant standing on a ledge against the outside wall of the building! (9) On the way to the meeting. (9) On the way to the meeting. (10) National Chengchi University is one of the oldest Universities in Taiwan. (10) National Chengchi University is one of the oldest Universities in Taiwan. (11) Situated at the hill foot the campus is green and attractive. (11) Situated at the hill foot the campus is green and attractive. (12) Jimmy leads the way holding the 'steady cam'. This helps give a still blur-free shot to the video. (12) Jimmy leads the way holding the 'steady cam'. This helps give a still blur-free shot to the video. (13) Families move easily around the campus. (13) Families move easily around the campus. (15) ...leaving the campus. (15) ...leaving the campus. (16) In front of the oldest department on the campus. (16) In front of the oldest department on the campus. (18) On the bus to the nightmarket for some filming. (18) On the bus to the nightmarket for some filming. (19) Jimmy, Jabby and Anastasia make sure all the equipment is on hand. (19) Jimmy, Jabby and Anastasia make sure all the equipment is on hand. (20) Jimmy is designated camera man. The steady cam is about to come into its own. (20) Jimmy is designated camera man. The steady cam is about to come into its own. (21) Packing equipment in the Taipei MRT. (21) Packing equipment in the Taipei MRT.